It wasn't immediately clear if the Justice Department’s probe is related to scrutiny of the FAA by the DOT inspector general’s office, reported earlier Sunday by The Wall Street Journal and that focuses on a safety system that has been implicated in the Oct. 29 Lion Air crash that killed 189 people, according to a government official briefed on its status. Aviation authorities are looking into whether the anti-stall system may have played a role in last week’s Ethiopian Airlines crash, which killed all 157 people on board. The WSJ sources add that the inspector general’s inquiry focuses on ensuring relevant documents and computer files are retained. The Justice Department probe involves a prosecutor in the fraud section of the department’s criminal division, a unit that has brought cases against well-known manufacturers over safety issues, including Takata Corp. The news comes at a sensitive time for both the FAA, which was among the last regulators to ground the 737 Max following a broad global response (led by China) and for Boeing, whose stock has tumbled in the aftermath of the latest crash, and as the WSJ notes, "it is highly unusual for federal prosecutors to investigate details of regulatory approval of commercial aircraft designs, or to use a criminal probe to delve into dealings between the FAA and the largest aircraft manufacturer the agency oversees." Probes of airliner programs or alleged lapses in federal safety oversight typically are handled as civil cases, often by the DOT inspector general. The inspector general, however, does have authority to make criminal referrals to federal prosecutors and has its own special agents. Ironically, over the years, U.S. aviation companies and airline officials have been sharply critical of foreign governments, including France, South Korea and others, for conducting criminal probes of some plane makers, their executives and in some cases, even individual pilots, after high-profile or fatal crashes. The FAA’s current enforcement policy stresses enhanced cooperation with domestic airlines and manufacturers—featuring voluntary sharing of important safety data—instead of seeking fines or imposing other punishment. News of the U.S. government scrutiny comes shortly after Ethiopia’s transport minister, Dagmawit Moges, said there were “clear similarities” between the two crashes. U.S. officials cautioned that it was too early to draw conclusions because data from the black boxes of the Ethiopian Airlines plane still need to be analyzed. The two crashes - which may be linked to the same structural defect on the airliner - have sparked the biggest crisis Boeing has faced in about two decades, threatening sales of a plane model that has been the aircraft giant’s most stable revenue source and potentially making it more time consuming and difficult to get future aircraft designs certified as safe to fly. Governments world-wide have grounded the MAX, an updated version of the decades-old 737, while investigators and engineers seek clues. 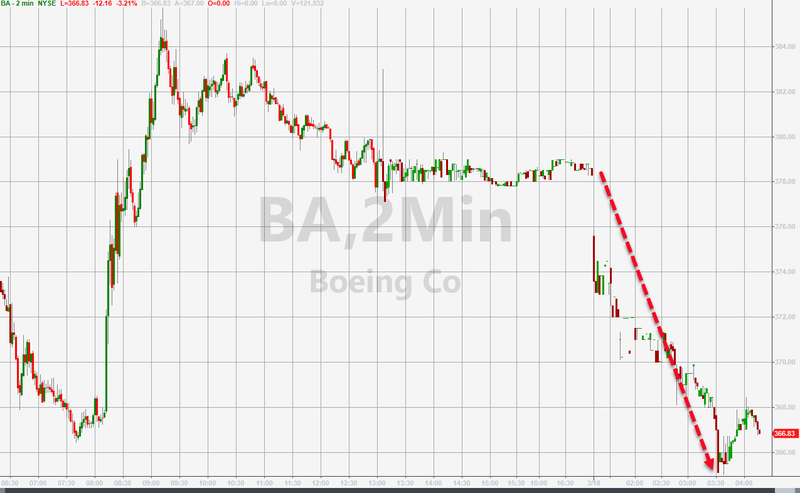 ... erasing most of Friday's gains which followed a report from Boeing that a software "fix" is being rolled out, which in light of the latest news, may no longer be useful especially if the government finds that "shot cuts" were taken in the development of the plane.